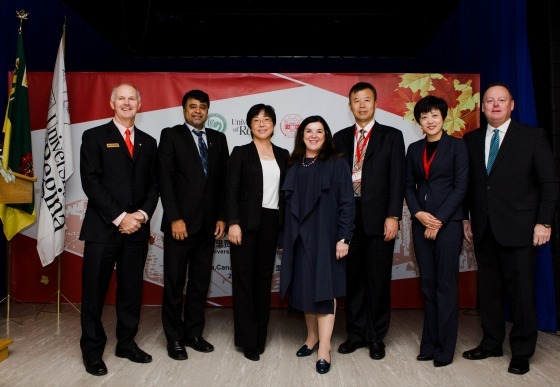 By Costa Maragos Posted: November 7, 2017 6:00 a.m.
President Dr. Vianne Timmons says the University of Regina has been deeply shaped by its connections with China. “In many ways, our relationship with China has helped define the University of Regina, and there are not many universities in the world who can say that,” says Timmons. President Timmons recently opened the 2017 Joint Conference of Canadian Confucius Institutes held at the University of Regina, when the Confucius Institute Headquarters held its annual regional conference of Canadian Confucius Institutes. Timmons noted the University’s special relationship with China. In 1981, U of R President Dr. Lloyd Barber signed an academic agreement with Shandong University – one of the first such agreements in Canada. That strong bond was also emphasized by the visiting delegates, including Xinyu Yang, Minister Counsellor, Embassy of the People’s Republic of China in Canada. “It’s always my pleasure to visit the University of Regina, not only because the U of R is the first Canadian post-secondary institution that formalized the partnership with Chinese universities after China opened its door to the world, but also that the U of R has greatly contributed to the establishment of the diplomatic relationship between Canada and China,” says Yang. The purpose of the conference was to exchange best practices and enhance the development of Confucius Institutes and the Confucius Classrooms in Canada. The conference included representatives from Confucius Institute headquarters; representatives from Hunan University; the Embassy of the People’s Republic of China in Canada; and Chinese Consuls’ General in Canada. The Confucius Institute, established at the U of R in 2011, is a joint initiative between the University of Regina and China’s Hunan University. The establishment of the Confucius Institute is based on the long-standing relationship and growing intellectual and economic exchange between Canada and China. The Institute offers many non-credit Chinese language courses and cultural workshops and programs. There are 12 Confucius Institutes and 36 Confucius Classrooms in Canada.